Snapshot Utility - allows you to take database schema snapshots via the command line. You can now for example, automatically take a daily snapshot of the database schema and then, whenever you need to, go back and see what schema changes were made from one snapshot to another or from one snapshot to the live database. Snapshot Converter - a standalone tool that allows you to convert in bulk database snapshots created with previous versions of the xSQL Schema Compare. New command line features - object exclusion by type or name, new element for complex schema filters, new elements for comparison options etc. Bug fixes - fixes some issues with the Command Line utility. If you visit our site today you will notice that the rolling product slides on top have been replaced by a single more "festive" slide - click on the "LEARN MORE" button to see what the deal of the day is. For the next 19 days of 2012 we will be running many different exciting promotions - visit the site daily to see what's on for a given day. Note: the deals are distributed randomly - they will NOT get progressively better or worse as we approach the end of the year so if you see a deal that appeals to you don't wait for a better one as it may never come. Today's deal is buy one license and get a second one free. The ultimate goal of a database schema comparison and synchronization tool, like xSQL Schema Compare for SQL Server (aka xSQL Object), is to allow database administrators and database developers to safely and efficiently propagate database schema changes from one environment to another, most commonly from development to staging to production. By default, xSQL Schema Compare for SQL Server includes all database objects in the comparison and synchronization and arranges the synchronization script in such a way as to respect the dependencies between the database objects, so that the script can be successfully executed on the target. However, often the user needs to run a partial comparison and synchronization including only certain objects. Let's say the user chooses to synchronize the database view vw_01 but neglects to include table tbl_01 on which this database view depends. In a scenario like this there is a good chance that the synchronization script will fail to execute successfully on the target (table tbl_01 might not exist in the target or might be different). The user will then have to identify the cause of the failure and go back and include table tbl_01 in the synchronization, but that is not the end of the story, there may be many similar situations involved and the script will keep failing. Going through this painful and expensive process of identifying the object dependencies through trial and error, would defeat the purpose of a schema comparison and synchronization tool. 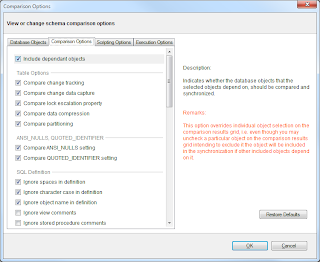 xSQL Schema Compare for SQL Server provides a critical comparison option "Include dependant objects" which is ON by default. 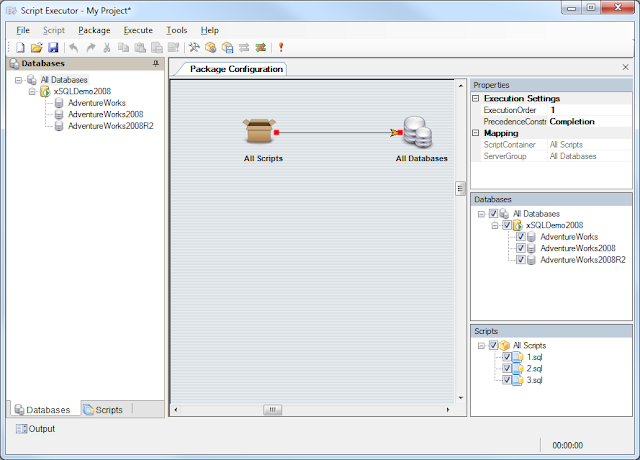 After the user has selected the database objects that he wants to include in the synchronization, xSQL Schema Compare will automatically identify all the additional objects that must be included in the synchronization for the script to execute successfully on the target, and will include those objects in the proper order regardless of the user selection. We often get support requests from users with the following question: "I have specifically excluded those database objects from the synchronization – why am I still seeing them in the synchronization script?!" The answer is the "include dependant objects" option the purpose of which was explained above. You can however easily turn the option off by un-checking the corresponding checkbox under comparison options (see the screen shot below). When comparing two SQL Server database objects, like comparing two tables, comparing two stored procedures, comparing two triggers, comparing two functions etc., the result of the comparison is not a clear cut "equal" or "different". The result depends on what you care to compare. The simplest example that demonstrates this point is the issue of spaces in the object definition: let's say you are comparing [DB1]. [SP1] with [DB2]. [SP1] and further let's assume that both stored procedures are identical except for the fact that [DB2]. [SP1] contains an extra blank line at the end of the definition. The question is: are the stored procedures [DB1]. [SP1] and [DB2]. [SP1] equal or are they different? Well, in this particular case if you only care about the functionality you would say that they are equal but if you also want those stored procedures to appear visually identical then you would say they are different. Like the example of "spaces in the definition" above, there are many other elements that affect the result of the comparison of different types of database objects. xSQL Schema Compare for SQL Server exposes over 40 comparison options that drive the comparison engine and affect the results of the comparison between two SQL Server database schemas giving you total control over the comparison and synchronization process. While this level of flexibility and control is very helpful for many users it is also often the cause of confusion for others. You compare table1 to table2 and they show as equal but a minute later when you run a re-compare they show as different even though you did not make any changes to the structure of those two tables! After a closer look you realize that in the first compare you did not consider the "lock escalation property" whereas on the second run you did and that caused those two tables to appear as different. 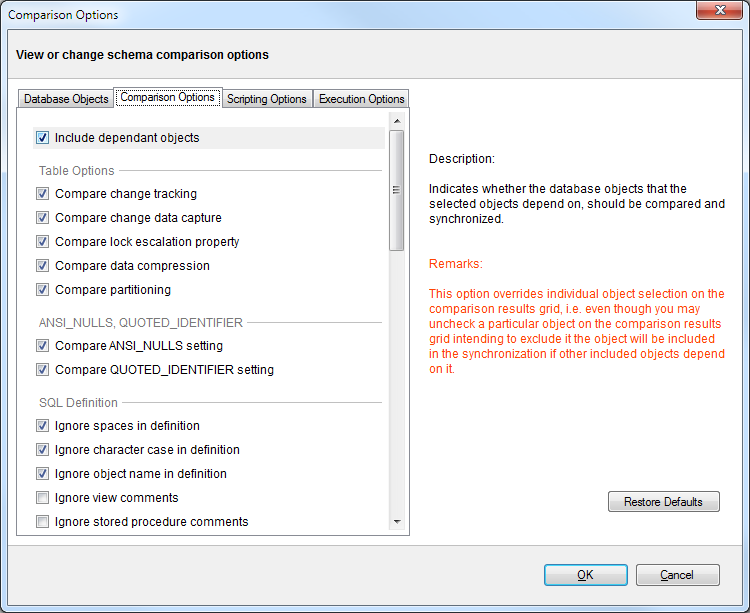 So, does the user need to spend time understanding all those options in the new xSQL Schema Compare for SQL Server? No, absolutely not! In over 95% of database schema comparison and synchronization cases the user does not need to look at or even be aware of the existence of those comparison options – just compare, generate synchronization script and execute it on target. xSQL Schema Compare for SQL Server is free for SQL Server Express – no limitations. It is also free for other editions of SQL Server but with some limitations on the number of objects in the database. Full support for SQL Server 2012. Enhanced support for SQL Server 2008 and SQL Server 2005 (some objects that were partially supported or not supported in previous versions are now fully supported). Support for SQL Server 2000 has been dropped. If you still need to compare and synchronize SQL Server 2000 databases you can contact us to obtain the older version of the schema compare tool. Over 100 options (object type inclusion/exclusion, comparison options, scripting options, and execution options give you total control over the comparison and synchronization process. The task of comparing the data in two databases seems fairly simple and straight forward until you start considering the size of the databases involved. To understand why let's present a common scenario and see what it takes to handle this seemingly simple task. Selectively push changes from the west coast database to the east coast one. Lastly, let's say that you, the database master reside somewhere in Atlanta and have a nice setup with a powerful machine and high bandwidth connection to both servers. So what's the problem you say? What do you do with let's say a 10 GB change script? How do you execute that against the target database? There are many data compare tools, especially SQL Server data compare tools in the market today but, unfortunately, (or maybe fortunately for us) most of them will simply fail at this task – some of them will fail very quickly while some other may take a while to crash. Row filters: if you know, as is often the case, that let's say on a given table any rows that have a modifieddate earlier than a given date have not changed and do not need to be compared then you add a row filter on that table pair and instead of comparing for example 10 million rows you only compare 100K rows – now that I a huge reduction on the workload! Column exclusions: SQL Server Data Compare and Oracle Data Compare allow the user to choose which columns on a given table to exclude from the comparison and synchronization. For example, a table that contains a text column might have 5GB worth of data on it but if you exclude that one text column the table only has 100MB of data – again a huge reduction on the workload. Lastly, you only need to go through this configuration ones – SQL Server Data Compare and Oracle Data Compare will remember every single comparison configuration detail so next time you can launch the comparison with a single click. The script which you can download from the link below creates a "countries" table and populates it with the complete ISO list inlcuding the Numerical Code of the country, the name of the country both in lower case letters and upper case letters, the ISO ALPHA-3 code and the ISO 3166-1-alpha-2 code. the Countries table created by the script does not have a Primary Key defined on it - you will need to define one. The following territories are listed on the ISO site but they are not listed on the UN site so I did not include them in the script. If you have worked with SQL Server for a while you either have built yourself or at least seen somewhere some sort of a GetNextValue(MyTable) function that returns the next available sequential ID for the given table. The way it worked was: you would have a small table with two columns (TableName, NextID) and the above function would read the corresponding ID from this table and increment the NextID column. Why was this necessary when you could use the auto incremented Identity column? A couple of reasons: you needed the ID before you inserted the row in the table; you wanted to be able to possibly re-use those IDs' and, you wanted to use the ID as a foreign key on dependent tables. You made this solution work and it was ok however, you had to handle concurrency (multiple processes requesting new IDs for the same table) and this process often became a bottleneck causing unexpected performance issues. The uniqueidentifier introduced in SQL Server 2005 was great but often that is not what you want, instead of a 50 character long unique identifier you want a sequential number. sql server also takes care of the performance as well - unlike your home build "next sequential value" mechanism the sequence object is unlikely to ever cause any issues for you. Note: the next version of our schema compare tool, xSQL Object, that will be released next month will include support for the sequence object as well. What is SQL Server Database Engine Tunning Advisor? SQL Server Database Engine Tuning Advisor helps you select and create an optimal set of indexes, indexed views, and partitions without requiring an expert understanding of the structure of the database or the internals of SQL Server. SQL Server Database Engine Tuning Advisor analyzes a workload and the physical implementation of one or more SQL Server databases. A workload is a set of Transact-SQL statements that execute against a database or databases that you want to tune. Database Engine Tuning Advisor uses trace files, trace tables, or Transact-SQL scripts as workload input when tuning databases. You can create Transact-SQL script workloads with the Query Editor in SQL Server Management Studio. You can create trace file and trace table workloads by using the Tuning Template in SQL Server Profiler. SQL Server Database Engine Tuning Advisor analyzes the workload and can recommend that you add, remove, or modify physical design structures in your databases. The advisor can also recommend what statistics should be collected to back up physical design structures. The physical design structures include clustered indexes, nonclustered indexes, indexed views, and partitioning. SQL Server Database Engine Tuning Advisor recommends a set of physical design structures that reduces the query optimizers estimated cost of the workload. Recommend the best mix of indexes for databases by using the query optimizer to analyze queries in a workload. parses and tunes queries referencing user-defined functions; tunes statements in triggers and a lot more. Enhanced Scalability - uses workload compression, which allows SQL Server Database Engine Tuning Advisor to reduce the amount of time spent tuning while producing high quality tuning recommendation results; uses an algorithm to avoid redundant statistics creation, which reduces the number of I/Os incurred during tuning. Integrated Tuning - SQL Server Database Engine Tuning Advisor can consider the trade offs in performance that are offered by various different types of physical design structures (indexes, indexed views, partitioning). Multiple Database Tuning - applications often access multiple databases to complete their work, so workloads frequently refer to objects from multiple SQL Server databases. SQL Server Database Engine Tuning Advisor can simultaneously tune multiple databases. Offload of Tuning Overhead to Test Server - tuning a large workload can create significant overhead on the server that is being tuned. This occurs because SQL Server Database Engine Tuning Advisor often needs to make several calls to the query optimizer during the tuning process. Using a test server in addition to your production server eliminates this problem. Command-Prompt Utility and Graphical User Interface Tool - SQL Server Database Tuning Engine Advisor provides a dta command-prompt utility to make it easy to incorporate SQL Server Database Engine Tuning Advisor functionality with scripting and also provides a graphical user interface (GUI) tool, which makes it easy to view tuning sessions and results. Drop-Only Tuning - physical design structures may accumulate over time in a SQL Server database, and database administrators need a way to drop those structures that are no longer useful. The drop-only tuning option is useful for identifying existing physical design structures that are either not used at all or have very little benefit for a given workload. XML Support - all of the tuning operations that you can perform with the SQL Server Database Engine Tuning Advisor GUI and the dta command-prompt utility can be defined in a Database Engine Tuning Advisor XML input file. User-specified Configuration and "What-if" Analysis Support - SQL Server Database Engine Tuning Advisor enables users to provide a hypothetical configuration of physical design structures (indexes, indexed views, and partitioning strategies) as tuning input. You can then tune a database or databases as if the configuration were already implemented. Analysis Reports - SQL Server Database Engine Tuning Advisor generates several analysis reports in text or in XML after a tuning session completes. These reports provide information such as the cost of queries occurring in the workload, the frequency of events that occur in the workload, or the relationships between queries and the indexes they reference. Tuning Sessions - SQL Server Database Engine Tuning Advisor prompts you to create a unique name or number to identity the tuning session before the analysis can begin. After analyzing a workload or when analysis is stopped, SQL Server Database Engine Tuning Advisor saves the tuning session information and associates it with the identifier you supplied before tuning began. Job security – the innate fear that automation will render our position as obsolete. Resistance to change – we do things this way because we have always done them this way; or, why try to fix something that is not broken. Being always under pressure and adapting a short term thinking – right now I need to take care of this task, I don’t have time to spend on researching how to do it faster and better. Underestimating the cumulative effect of manual tasks –a task that only takes let's say 15 minutes a day to complete does not “scream” I need automation BUT in one year you will end up spending about 10 full days of work on that task. Overestimating the cost of automation - it will take too much time and money to acquire and implement a solution. None of those reasons constitute a good, rational argument to forgo automation. On the other hand there is the other extreme, automating for the sake of automating. The decision on whether to automate a process / task or not should be based on a rigorous and objective method that is based on numbers and not on feelings. So the question is: how much time will it take to break even? Or, stated differently, how long will it take for this automation to pay for itself? Note that if TMC/12 + TTAA*VT >= VT*TT*TF then the investment will never pay off in pure financial terms so, unless there are other important considerations then this will be a no go. So, what is a good t? That depends, but generally, anything under 6 months is usually a no brainer. However, as there are always other potential investments competing for the same budget you will need to compare the parameters of this with those of the other potential investments to make the right decision. xSQL Data Compare is designed to compare the data in two SQL Server databases and generate the change script to make database A the same as database B or vice versa - in other words it is designed to go in only one direction at a time. However, while this one directional synchronization is very helpful in various scenarios it does not address the need of the users who are in charge of managing distributed databases and that for one reason or another are not able to implement a SQL replication solution. While not an ideal solution, with a bit of effort those users can use xSQL Data Compare to address this issue. First let's assume that table T1 has a TimeStamp column that will be used to decide which record overrides which. Now, add column S2_TimeStamp on table S1.T1 and add column S1_TimeStamp on table S2.T1. You will need to make sure that the new timestamp columns are automatically updates anytime the row is modified. Create a view for S1.T1 and a view for S2.T1 naming the timestamp columns in such a way that the name of S1.T1.TimeStamp matches S2.T1.S1_TimeStamp and S2.T1.TimeStamp matches S1.T1.S2_TimeStamp. The view on S1 will contain the following columns: T1.ID, T1.TimeStamp as TimeStamp1, T1.S2_TimeStamp as TimeStamp2 whereas the view on S2 will contain: T1.ID, T1.TimeStamp as TimeStamp2, T1.S1_TimeStamp as TimeStamp1. This will ensure that the columns of S1.T1 are automatically mapped with columns of S2.T1. Exclude wT1.TimeStamp2 column and generate the script that makes S2.wT1 the same as S1.wT1. Execute the script – this will update the S2.T1 table with the timestamp from S1 without touching the S2 timestamp. Now include wT1.TimeStamp2 and exclude wT1.TimeStamp1 and generate the script that makes S1.wT1 the same as S2.wT1. Execute the script – this will update the S1.T1 table with the timestamp from S1 without touching the S1 timestamp. Now you are ready for the final step – compare table S1.T1 with S2.T1 adding a WHERE clause for each side to exclude the rows where the timestamps are the same. You will need to repeat this process twice: first, you only include rows where S1.T1.TimeStamp > S1.T1.S2_TimeStamp – you will need to "push" those rows from S1 to S2; then, you include only the rows where S2.T1.TimeStamp > S2.T1.S1_TimeStamp – you will need to push those rows from S2 to S1. You can use the SQL Data Compare command line utility to automate all those comparison steps. xSQL Data Compare is free for SQL Express and also for other editions of SQL Server with some limitations (check the details here: http://www.xsql.com/products/sql_server_data_compare/editions.aspx). I had the priveledge of working on a document management system recently. Unfortunately, for whatever reason, there were new tables created for each year. For example, documents imported into the database in 2011 were in table Documents_2011. There were over 200 databases, and to make matters worse, not all databases contained every year. If the client started in 2008, there were tables starting from 2008. If they started in 2011, the first table would be 2011. After running a few thoughts in my head, I decided to try the new SQL TRY CATCH block. I first found the earliest year that was used. In this case it was 2002. Start by creating a temp table. Next, use a WHILE loop and start at the first year possible. Dynamically create an INSERT INTO SELECT statement. Execute the statement. Add 1 to the year and continue looping until the current year. Since this database required scripts to be run at the beginning of each year, this stored procedure would not have to change since it dynamically queries all tables from START year to CURRENT year. You have set up SQL Server merge replication between your primary site and your DR (disaster recovery) site – this allows you to use the DR site as an overflow site when you have volume spikes on the primary site and the bottleneck is not SQL Server. It is a pretty cool setup indeed with SQL Server seamlessly taking care of keeping both databases in sync with each other. You have further tested the failover to the DR site multiple times and everything worked flawlessly, so you assure the management that you have implemented a “fool-proof” system and as far as SQL Server is concerned any failure on the primary site will be transparent to the end users. Sooner or later, as it inevitably does, disaster strikes and your primary site is completely out of commission. As planned and expected the DR site takes over and everything is working fine, at first… a couple of hours into this disaster a mission critical application starts failing. You start digging into your logs and see this “unique constraint violation” error which does not seem to make sense and the first thing that comes to mind is that the developers must have screwed up somewhere and you might need to revert to an older version of that application. In the meantime the operations have come to a complete halt and you don’t know where to hide. So what caused this? No, it wasn’t the developers that messed up but rather the root cause of this is the way SQL Server Merge Replication handles identity columns. You can read this Microsoft article for a more complete overview http://msdn.microsoft.com/en-us/library/ms152543.aspx but in short to avoid “clashing” of the IDs between primary and secondary servers the primary server is in charge of assigning blocks of IDs to the secondary server that do not overlap with the IDs the primary is using and making sure that the secondary always has IDs available. But, if the primary server is not available for an extended period of time the secondary might exhaust all the available IDs after which any inserts to that table will fail. There are multiple ways you can deal with this like managing the ID blocs so that sufficiently large blocks are assigned to the secondary; monitoring the usage of those IDs on the secondary and stopping the replication altogether if necessary, avoiding the use of the identity columns as primary keys for tables etc. However, the purpose of this brief article is to make you aware of this potential problem that you might face when using SQL server merge replication for disaster recovery. Don't forget to check out our SQL Server Data Compare and Synchronization tool: http://www.xsql.com/products/sql_server_data_compare/ - it is one of the most useful sql server tools and it also comes in a free lite edition. In most cases when you need to compare and synchronize data in two databases the schemas of the databases in question are the same so xSQL Data Compare automatically pairs the tables and maps the columns based on names. However, there are cases when you might need to compare data in two tables with different names and different column names. Compare and synchronize those two views instead – the columns will be mapped automatically since they have the same names but the updates during the synchronization will happen on the underlying columns which have different names. Since SQL Server does not support SET IDENTITY_INSERT ON|OFF on views, the insert statements might fail if one of the view’s underlying tables contains an identity column. Data Compare cannot synchronize views that contain large binary fields such as varbinary(max) and image, or views with large text field such as varchar(max), nvarchar(max), text and ntext. SQL Data Compare tool - fixes a problem that occurs when the first column of the chosen data comparison key is created as a descending column. Symptom: SQL Data Compare tool fails to identify the rows that exist in both tables being compared. SQL Data Compare tool - fixes a problem with the data candidate index defined on columns that allow NULL values. Symptom: Data Compare prepares update queries with where clause as “and fieldname = null” in cases when the key used includes a nullable column. 3.sql : security role creation, access rights, etc. On the “Databases” panel on the left side right click on “All Databases” and then click on “Add Databases…” and add all three databases DEV, TEST and PROD to that database group. Of course you can rename the database group and create new database groups. In a more complex deployment scenario you might want to create different database groups for development, test and production databases. Click on the “Scripts” tab on the left panel , right click on “All Scripts” and then click on “Add Scripts…” and add the scripts you wish to deploy. You can easily order the scripts by right clicking on a script and then moving that script up or down in the sequence. Next go to Package / Configure… - Script Executor will perform an automated mapping of Database Groups to Script Containers (see the screen shot below). You can then easily tweak the mapping based on your needs. Now if this is an on-demand deployment you can utilize the GUI to execute the package. Script Executor will execute each script against each database the script is mapped to and on completion you will see a detailed deployment report. You will also be able to browse through the result sets if one or more of those scripts returned any rows. Use Windows Task Scheduler to schedule the execution of the batch file. You don’t have Script Executor installed on the machine from which you will do the deployment. In this case you can go to Execute / Build Executable… to build a ready to deploy executable package that embeds all the target database information as well as the t-sql scripts you wish to deploy. You can then put that executable package on the machine from which you will do the deployment and you are ready to go. Use Windows Task scheduler to schedule the execution of this executable package and you are done. Script Executor is the most powerful and robust t-sql script deployment tool in the market – it can handle any script deployment scenario you might have at a very low cost. The ability to wrap t-sql scripts in a ready to deploy executable eliminates the need for purchasing multiple licenses and makes it easy to deploy to remote client sites. In addition of SQL Server 2012, SQL Server 2008, SQL Server 2005 and SQL Server 2000, Script Executor also supports MySQL and DB2 and SQL Server Compact Edition. Starting today (March 26, 2012) we will be giving away 10 Oracle Data Compare licenses (a $349 value) for free, every day for 10 days. The promo code ODC10DAYS will be active for a few minutes each day. The starting time and the estimated time interval will be announced at least 2 hours in advance on twitter (www.twitter.com/xsqlsoftware) and facebook (www.facebook.com/xsqlsoftware) every day. Once the first 10 licenses are claimed the promo code will be de-activated and you will have to wait until the following day to get your free license. In all, during the next 1o days we will give away 100 Oracle Data Compare licenses or $34,900 in free software. You have hundreds of customers you need to distribute your software to. A simple wizard guides you through a few steps that lead to the creation of an executable package that contains all the necessary information required to upgrade your customers’ databases. A detailed log is emailed back to you so that you know exactly what happened at the customer's site. The beauty of this is that the deployment package "does not care" what version of your database the customer is on. Of course the wizard is quick and easy but what if you need to tweak something that the wizard does not provide for? We thought of that too – xSQL Builder comes with a set of customizable C# templates (C# classes) that contain the compare and synchronization code that runs on the client machine. xSQL Builder ships with a VS.NET 2005 C# project that you can run or modify as needed. Download now and see for yourself what you have been missing all this time! Since Paypal (it’s parent eBay at the time) acquired Verisign’s payment gateway in 2005 we have been a Paypal customer and aside from a complete screw up a couple of years ago that left us without service for 3 days everything has gone smoothly. However, the experience of a few days ago when we decided to switch from payflow link to payflow pro prompted me to write this quick review. Since the acquisition of Verisign's gateway services Paypal has made no improvements whatsoever on the payflow link solution, which is what we were using. It was embarrassing to “hand the customer over” to paypal to finalize the payment – the customer was presented with an ugly form (the branding/customization capabilities were a joke) and an un-necessary two step process that left the customers with an un-easy feeling. I think Paypal should either put some serious effort on improving the solution or drop it altogether, it is just not serious to keep it the way it is right now. Lastly, while implementing all three solutions (we had Payflow Link, mistakenly implemented Website Payments Pro, and finally Payflow Pro) we were surprised by the inconsistent implementation on the paypal side, three solutions – three different sets of parameters even though we are passing basically the same set of data. Of course we understand that Paypal has every incentive to push vendors like us away from those inherited “gateway only” solutions towards their “full service” solutions but frustrating vendors is not the way to do it. Email addresses: all email addresses have been changed to the new domain so sales@xsqlsoftware.com is now sales@xsql.com and so on. The old addresses have been forwarded to the corresponding new addresses. License activation: if you have an older build of any of our tools and you have acquired a license you might not be able to activate the license as the license activation services that were running under the xsqlsoftware.com are no longer available. In such case you can either download a new build of the tool or generate a license request file and email it to us (instructions are provided on the license activation window). Links to our site: if you have linked to our website from your blog or your site we would be grateful if you would make the effort of updating the url with the new domain. The old url should work fine too but it would be very helpful to us if you did update the url. Chronology for the curious: when we launched our first web site in 2004 our desire was to get the xsql.com domain but unfortunately we were not able to secure it then so we decided to go instead with x-sql.com. In 2007 after a complete revamp of our site and our key tools we decided that we did not like the dash in the url anymore and thought that it was better to have a longer url without dashes than a short one with dashes. Hence, our main domain became xsqlsoftware.com. Now, 8 years later we have what we wanted in the first place – the easy to remember, easy to type, elegant url: http://www.xsql.com. And yes, this is the end of our quest for the perfect domain - no more changes. Installation of RSS Reporter V3 may fail with a generic message: “The installer was interrupted before RSS Reporter could be installed. You need to restart the installer and try again.” But, as you can easily guess, restarting the installer is not going to do any good. If you check the event viewer you will see an MsiInstaller event 1033 that misleadingly states that “Windows Installer installed the product…Installation success or error status: 1603”. The cause of the problem is a missing IIS component (Metabase) that by default is not installed in IIS7 but, the Visual Studio installer that we use for RSS Reporter requires it. In IIS7 this feature can be found in setup under Internet Information Services->Web Management Tools -> IIS 6.0 Management Capability Feature. Check the “IIS MEtabase and IIS6 configuration compatibility”. Once the installation of the metabase component is finished re-run the RSS Reporter installation package and it should install successfully. RSS Reporter is a simple tool that generates standard rss feeds from SQL Server. Predefined SQL job feeds allow you to monitor SQL jobs on multiple servers from a single rss feed. Ad-hoc query feeds allow you to generate rss feeds containing the data that the query returns. RSS Reporter is free for a single SQL Server instance and very inexpensive for multiple SQL Server instances. You can download your copy here. Execute the sync script (this step in the process will publish all the data changes you made on development into the production database). “Configure once”: xSQL Data Compare saves all your comparison configuration settings in a comparison “session” so that next time you can launch the comparison with one click and complete the whole data synchronization process with two more clicks (one to generate the sync script and one to execute the sync script). Command line utility: allows you to run the comparison and synchronization in one step from the command line. It is completely free for SQL Server Express without any limitations and it is also free for other editions of SQL Server as long as the number of objects in your database does not exceed certain limits. Download your copy today and discover for yourself why thousands of users around the world swear by this simple but extremely helpful sql tool. You have completed your work and are now ready to publish the new build of your application. The challenge is that those database changes must be published together with the new build of the application otherwise your application will not work the way it is supposed to. Missed changes – some change scripts would not make it to the script repository. Those missed database changes would only be discovered when the application would error out because an object was missing or a type didn’t match etc. Those missed changes would results in many wasted hours and frustration. Failure to execute – some scripts would fail to execute successfully because of dependencies. Ordering the scripts is a painful, time consuming process especially when multiple developers are involved. Significant amount of time consumed in creating rollback scripts that would make it possible to reverse the changes if something went wrong. The developers can make the changes they need to make on the database without having to worry about keeping track of those changes and creating change scripts and rollback scripts. Launch xSQL Object and instruct it to compare the schema of the development database where those changes were made with the target database where you want to publish those changes. xSQL Object will compare the schemas and show you exactly what changes have been made. It will then generate a synchronization script that when executed will make all those changes into the target database in the proper order. It will also generate the “rollback” script that will allow you to reverse those changes if necessary. Review the script and execute against the target. From many hours of tedious work with questionable results we have automated the process and brought the time required to complete the task down to a few minutes of easy work with guaranteed results. Download your copy of xSQL Object today and see for yourself what you have been missing. There is no better way to spend the next 5 minutes of your time than downloading and installing a tool that will save you many valuable hours and for which you will likely not have to pay anything since the free lite edition is probably all you need. No one writes code for altruism. No one wakes up one beautiful day and decides to spend the next few thousand hours of his life staring and cursing at a computer monitor for the sole purpose of helping others. Whether explicit or not, the profit motive is the real driving force, so the question we as software publishers face is not whether we should give something out for free for the sake of helping the world or charge for it for the sake of profit but rather the question and the challenge we face is determining how much free is just enough free. If you give out more than necessary you are sure to face a slow and painful "death" while somewhat paradoxically your software's popularity grows. If for example what you give out for free takes care of 90% of potential customers' needs you will hardly sell anything and will likely be "on the red" from start to finish. Your fall will become even more painful by the fact that all those users that have benefited from your work gradually grow to feel entitled – they demand that you continue improving your software while they will throw a fit if you dare to suggest that they should pay. On the other hand, if you don't give out enough free there is a good chance that a low cost startup imitator or even a more powerful competitor will undercut you and potentially put you in a "death" spiral – the return on the investment you made starts to diminish rapidly, you are forced to make cuts on product development and marketing, the product gets outdated, sales start dropping and you, or at least that product, will soon be history. How about going the other way? I think that is very hard to impossible to do – if you start with giving everything out for free, the moment you decide to start charging is the moment when you will see all your user base "evaporate" rapidly. Redundant disclaimer: please note that this is a very simplistic view – in reality, this process is significantly harder to manage as those numbers mentioned above are affected by a multitude of factors that I have "conveniently" left out of the discussion. First: we take the @accountnumber parameter that is passed to our stored procedure and build a small table variable containing all the possible values of this account number by padding the number with leading zeros up to the max length of 20 characters. the optimizer will now do an index seek on your accountnumber index and return the results in a fraction of the time while completely elimintaing the performance issues that a clustered index scan on a large table would cause. PS check out our xSQL Profiler - it allows you to schedule, run traces and automatically collect trace data from multiple servers. It is free for one SQL Server instance. Table names might not be exactly the same – for example, on one database the customer's table might be named dev_customer whereas on another database might be named prod_customer. Completely ignore the schema name. In this case [database1].[dev]. [customer] will be mapped to [database2].[prod].[customer]. Ignore a certain name postfix on the left database and a certain name postfix on the right database. Download your copy of xSQL Data Compare and see for yourself why this is the best sql data compare tool in the market, and on top of that you might not have to pay anything for it. A new build of Script Executor with support for SQL Server 2012 is now available for download. Script Executor allows you to execute multiple t-sql scripts, in the order you desire, against multiple SQL Server, MySQL and DB2 databases. It also allows you to package a set of scripts into an executable that can be easily deployed to remote clients. A command line utility is also included. Support for SSRS in SharePoint Integrated mode. Support for fetching permissions objects in Oracle. Support for fetching dependencies between objects in different schemas in Oracle. Support for drawing data model diagrams with GraphViz. Improved performance when excluding a large number of objects. Added textboxes for delimiters in the GUI. Bug fix: exclude indexes if parent table is also excluded. Bug fix for DB2 if can't get pagesize. Bug fix: fixed a bug for Oracle where functions weren't being returned unless DocumentProcedure was set TRUE. SSIS fix: take server name from file path for DTSX files if the path is UNC. From a software vendor's point of view, or any vendor's point of view for that matter, LinkedIn appears to be an ideal platform for promoting products. There are not many places where the audience by definition is exactly what you are looking for and exactly the audience that would benefit from your products. For example: if you target a SQL Server group like "SQL Server Developers" or "SQL Server Professionals" you know that other than the ever present recruiters everybody else is involved with SQL Server in one capacity or another. So, if the product you are promoting through your ad is directly related with SQL Server chances are that a number of those group members might be interested. So we created a couple of simple ads that clearly state what the products we are promoting are about. The ad for xSQL Object reads: "SQL Schema Compare", "Compare and synchronize SQL Server Schema. Free lite edition. Supports 2008/2005/2000"; and the ad for Oracle Data Compare reads "Oracle Data Compare", "Compare and synchronize data between two databases – Oracle 9i/10g/11g". We carefully chose the groups we wanted to target with those ads. First we see that the number of impressions goes quickly in the thousands but the click through ratio is really, really low. This part of the puzzle turns out to be easy to solve – it seems that since we bid the minimum allowed, that is $2 instead of the LinkedIn recommended bid of $3.27 to $4.05, one needs to scroll about a mile (a bit of exaggeration here) to reach the bottom of the page for a given group where you might see the ad in question. So, of course most of those impressions (maybe over 99%) are worthless since virtually nobody really sees it – aren’t we glad we did not choose to pay per impression! The pages they see (xSQL Object and Oracle Data Compare respectively) provide exactly the information you must be looking for since you clicked on that advertisement. So, who is clicking on our ads!? We don’t know yet but what we know is that those people are certainly not looking for our products! If you have a positive experience with LinkedIn ads please do write to us or just comment on this blog. We would love to hear from you as we still believe that LinkedIn can be a very valuable to us but maybe we are just approaching this the wrong way. Only when, at least one of the databases in the comparison is on a SQL Server edition other than the Express edition then we count the number of objects in that database and if the number is greater than certain limits we have set then you will be kindly asked to purchase a license. The companion tool, xSQL Data Compare (you download both tools in one package) is also free for SQL Server Express with no limitations and free for other editions of SQL Server with some restrictions. MSDE 2000 (Microsoft SQL Server Desktop Engine) can be downloaded from http://www.microsoft.com/download/en/details.aspx?displaylang=en&id=22661 (other editions of SQL Server 2000 are not available for download anymore). Note that SQL Server 2000 is reaching the end of its life (support for it ends on April 2013) so consider downloading SQL Server 2008 instead unless you don't have a choice. xSQL Data Compare allows you to compare and synchronize data between two databases and it is also free for MSDE 2000.
xSQL Profiler allows you to trace multiple SQL Server instances including tracing MSDE instances and it is free for one SQL Server instance. xSQL Documenter generates CHM and HTML documentation for any database including SQL Server 2000 and MSDE 2000. RSS Reporter allows you to generate rss feeds from SQL Server and it is free for one SQL Server instance.